Lists the results from a small sample of DDR4 2133 Non-ECC UDIMM modules tested on Intel® reference desktop platforms based on 6th generation Intel® Core™ i7 processors (codename Skylake). 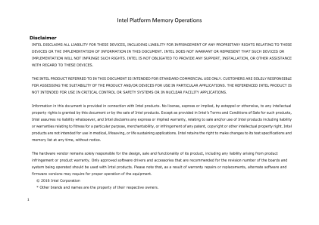 We are providing this information as a guide to module performance with Intel® reference platforms. This testing is not intended to replace the normal OEM ...component qualification process. For results on specific Intel® motherboards or OEM production motherboards, please refer to the OEM's list of qualified memory suppliers.